Using retrospective union, birth, and education histories that span 1980–2003, this study investigates nonmarital childbearing in contemporary Russia. We employ a combination of methods to decompose fertility rates by union status and analyze the processes that lead to a nonmarital birth. We find that the increase in the percentage of nonmarital births was driven mainly by the growing proportion of women who cohabit before conception, not changing fertility behavior of cohabitors or changes in union behavior after conception. The relationship between education and nonmarital childbearing has remained stable: the least-educated women have the highest birth rates within cohabitation and as single mothers, primarily because of their lower probability of legitimating a nonmarital conception. These findings suggest that nonmarital childbearing Russia has more in common with the pattern of disadvantage in the United States than with the second demographic transition. We also find several aspects of nonmarital childbearing that neither of these perspectives anticipates. This research was supported by a core grant from the Eunice Kennedy Shriver National Institute of Health and Child Development to the Center for Demography and Ecology at the University of Wisconsin–Madison (R24 HD047873) and the Max Planck Institute. The Russian Generations and Gender Survey (GGS) was conducted by the Independent Institute of Social Policy (Moscow) with the financial support of the Pension Fund of the Russian Federation and the Max-Planck-Gesellschaft, Germany. The design and standard survey instruments of the GGS were adjusted to the Russian context by the Independent Institute of Social Policy (Moscow) and the Demoscope Independent Research Center (Moscow) in collaboration with the Max Planck Institute for Demographic Research (Rostock, Germany). We are grateful to Jan Hoem, anonymous reviewers, and colleagues at the Max Planck Institute for Demographic Research for comments on earlier versions. Numbers in parentheses are t statistics. Data are from the Russian GGS. Numbers in parentheses are t statistics. The reference category for each model is married at birth, women aged 15–49. Data are from the Russian GGS. Musick, K. (2007). Cohabitation, nonmarital childbearing and the marriage process. Demographic Research, 16, article 9:249–86. Available online at http://www.demographic-research.org/Volumes/Vol16/9. Muszynska, M. (2008). Women’s employment and union dissolution in a changing socio-economic context in Russia. Demographic Research, 18, article 6:181–204. Available online at http://www.demographic-research.org/Volumes/Vol18/6. Philipov, D., & Jasiloniene, A. (2008). Union formation and fertility in Bulgaria and Russia: A life table description of recent trends. Demographic Research, 19, article 62:2057–14. 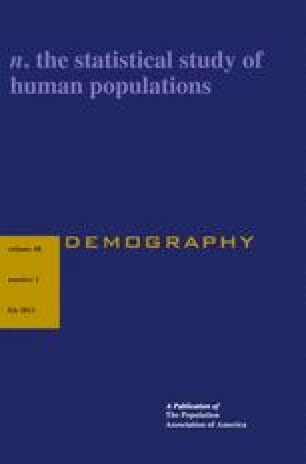 Available online at http://www.demographic-research.org/volumes/vol19/62. Sobotka, T. 2008. “The diverse faces of the second demographic transition in Europe.” Demographic Research, 19, article 8:171–224. Available online at http://www.demographic-research.org/volumes/vol19/8. Surkyn, J., & Lesthaeghe, R. (2004). Value orientations and the second demographic transition (SDT) in northern, western, and southern Europe: An update. Demographic Research, Special Collection 3, article 3:45–86. Available online at http://www.demographic-research.org/special/3/3. Vikat, A., Spéder, Z., Beets, G., Billari, F. C., Bühler, C., Désesquelles, A., et al. (2007). Generations and gender survey (GGS): Towards a better understanding of relationships and processes in the life course. Demographic Research, 17, article 14):389–440. Available online at http://www.demographic-research.org/Volumes/Vol17/14.